It’s not the first time that a non-farm payrolls rally wiped away inklings of market anxiety. Coming early in the month – and on Fridays – the jobs report typically makes for interesting trading dynamics. By the end of another interesting week, the timely reemergence of “goldilocks” along with Trump The Deregulator were propelling stocks higher. Long forgotten were Monday’s “Stocks Fall Most in Month…” and “Trump Rally Hits Speed Bump on Immigration Concern.” Indeed, markets were grateful to let a number of developments slip from memory. It’s still worth mentioning a few indicators that were beginning to lean away from “Risk On”. Prior to Friday’s jump, the powerful bank stock rally had stalled. The BKX was down almost 2% from Thursday to Thursday (Italian banks down 3.4% this week and Japanese banks 2.9%). Small cap stocks have underperformed, with the Russell 2000 down slightly y-t-d as of Thursday’s close. Many “Trump Rally” stocks and trades have recently underperform. Equity fund flows were negative for three straight weeks. In high-yield debt, the rally had similarly lost momentum. Also noteworthy, Treasuries rallied only tepidly on Monday’s equity market selloff. European bonds continue to trade poorly (Greek yields up 33 bps; French spreads to bunds widened another 10bps). This week saw bullion jump $29. The dollar Index is now down 2.5% y-t-d. The dollar/yen has for a while now been a key market indicator. After trading as low as 101.2 on election night market drama, Trump-induced king dollar euphoria had the dollar/yen surging to almost 119 by early January. The dollar/yen traded down to almost 112 on Thursday, to a two-month low. And similar to Treasuries, the dollar/yen these days struggles to participate during “Risk On” days. Trading slightly higher Friday, the yen jumped 2.2% against the dollar this week. February 2 – Nikkei Asian Review (Mikio Sugeno): “By accusing Germany and Japan of intentionally devaluing their currencies, the Donald Trump administration has attacked normal monetary policy designed to maintain healthy inflation, a dangerous step that could upend an understanding long shared by major economic powers. It was a moment Haruhiko Kuroda had been dreading. The Bank of Japan governor told reporters Tuesday after the central bank's two-day policy meeting that the new U.S. administration is still taking its first steps, and that the BOJ ‘will see how things play out.’ He knew anything he said could be misconstrued. Several hours later, the president called out China and Japan by name as having devalued their currencies over the course of years: ‘They play the money market, they play the devaluation market’ while the U.S. sits idly by, Trump said.”This week offered some important clarity: Trump is no devotee of king dollar, while he views QE as a mechanism for currency devaluation. Oh, how the world is changing. Throughout the markets, king dollar has been integral to recent global risk embracement. I’ll assume global “Risk On” has been fueled in part by significant carry-trade speculative leveraging (short yen, euro, swissy instruments to provide financing for higher-yielding securities elsewhere). There are now major uncertainties that should ensure heightened currency market volatility going forward. This creates a less compelling risk vs. return calculus for carry trade leverage, increasing the probability that, once commenced, a de-risking/de-leveraging dynamic could become self-reinforcing. The overarching thesis for 2017 holds a high probability for a tightening of global monetary conditions that would catch inflated global markets extraordinarily vulnerable. In short, the Crowded King Dollar Trade is exposed to Trump Administration antipathy for dollar strength, with potential implications for market de-leveraging (waning liquidity). Secondly, the two major sources of global QE/liquidity – the ECB and BOJ – are more susceptible to policy reassessment than generally perceived by complacent markets. Both central banks are trapped in flawed policies, and both are poised to be on the receiving end of The Wrath of Trump. What’s more, the Japanese have traditionally accepted U.S. direction with obedience. (The BOJ must be wondering what happened to Bernanke’s “enrich thy neighbor”.) Third, Beijing officials seem seriously determined to try to rein in China’s out of control Credit Bubble. This increases the odds of a major Credit event unfolding in China in 2017, with all the associated policy, market and economic uncertainties. When it comes to the late-stage of a major Credit Bubble, the analysis in a way simplifies: The Bubble bursts or it inflates to only more perilous extremes. Recalling 2007, well-entrenched Bubbles develop powerful momentum with the capacity to brush off even significant shocks. Such resilience works to bolster already powerful bullish market sentiment, associated flows and speculative impulses (and “inflationary biases” more generally). This dynamic helps explain why Bubbles can go to such extremes before catching almost everyone by surprise when they eventually falter. 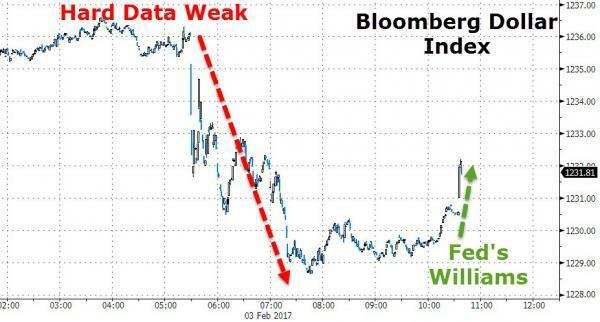 The VIX dropped 10% during Friday’s rally, punishing those that were tempted to play for a market reversal with cheap option trades. The VIX closed the week at 10.79, trading Friday at the lowest level since early 2007. To be sure, option pricing fails to reflect political uncertainties. This week our President put many “on notice”, foe and friend alike. The Wrath list included Iran, China, Germany, Mexico, the ECB and BOJ, and even our dear friends in Australia. A U.S. television commentator quipped that it really takes a lot to get the Australians upset with America, yet President Trump found a way. If the stock market had been under significant pressure this week, the rumblings questioning our President’s competence and emotional stability would have ratcheted up. The problem is that finance doesn’t make America great. The global “system” today is nothing as imagined 75 years ago and, for good reason, most people in the world have little trust in international finance. Central banks are not independent and “finance and economic life” have been anything but free from “political motivation.” Instead, unfettered global finance and central bank-led inflationism have created serial booms and busts that evolved into today’s perilous financial, economic, social and geopolitical discord. The unprecedented inflation of finance is fundamental to the problem - and not, as should be abundantly obvious by now, constructive when it comes to finding a lasting solution. I could only chuckle at the headline: “Dan Loeb: Trump Will Make Hedge Funds Great Again.” In a meeting with pharmaceutical executives earlier in the week, a delightful President Trump promised to slash regulation and red tape. But he just needs a little something in return from the industry: Dramatically Lower Prices. The Art of the Deal. Our new President and his Administration are at this point an enigma. Folks are beginning to accept that he’s not going to change, which is none too comforting to many. Shock and dismay understate reactions both at home and abroad. Yet when it comes to financial markets, when anxiety begins to strike simply repeat, “de-regulation, tax cuts, de-regulation, tax cuts…” The President certainly has everyone’s attention, with Wall Street and corporate America having donned kid gloves. But I don’t believe anyone is comfortable that they understand what the President and his inner circle really have in mind. Whatever it may be, they’re going to be in your face tough and idiosyncratic. How big of a conflict are they willing to accept early in the new Administration? At the end of the day, I suspect they don’t share the view that America will be made great again through hedge funds, inflated securities prices and ever greater quantities of “money” and Credit. Sure, they’ll play the game so long as they see it to their advantage. Markets, of course, remain convinced that buoyant securities markets are more indispensable than ever - and that Trump will bluster but knows better than to mess with the markets or their benefactor, central banking. Not that they’re in any hurry to burst Bubbles, but the Trump folks have their own perspectives, ideas and ambitions. I suspect that Carney’s “15 minutes of fame” comment resonates within The Inner Circle. A new era has commenced, and these central bankers and Wall Street icons have occupied the limelight for too long already. AMONG the many things that Donald Trump dislikes are big global firms. Faceless and rootless, they stand accused of unleashing “carnage” on ordinary Americans by shipping jobs and factories abroad. His answer is to domesticate these marauding multinationals. Lower taxes will draw their cash home, border charges will hobble their cross-border supply chains and the trade deals that help them do business will be rewritten. To avoid punitive treatment, “all you have to do is stay,” he told American bosses this week. Mr Trump is unusual in his aggressively protectionist tone. But in many ways he is behind the times. Multinational companies, the agents behind global integration, were already in retreat well before the populist revolts of 2016. Their financial performance has slipped so that they are no longer outstripping local firms. Many seem to have exhausted their ability to cut costs and taxes and to out-think their local competitors. Mr Trump’s broadsides are aimed at companies that are surprisingly vulnerable and, in many cases, are already heading home. The impact on global commerce will be profound. Multinational firms (those that do a large chunk of their business outside their home region) employ only one in 50 of the world’s workers. But they matter. A few thousand firms influence what billions of people watch, wear and eat. The likes of IBM, McDonald’s, Ford, H&M, Infosys, Lenovo and Honda have been the benchmark for managers. They co-ordinate the supply chains that account for over 50% of all trade. They account for a third of the value of the world’s stockmarkets and they own the lion’s share of its intellectual property—from lingerie designs to virtual-reality software and diabetes drugs. They boomed in the early 1990s, as China and the former Soviet bloc opened and Europe integrated. Investors liked global firms’ economies of scale and efficiency. Rather than running themselves as national fiefs, firms unbundled their functions. A Chinese factory might use tools from Germany, have owners in the United States, pay taxes in Luxembourg and sell to Japan. Governments in the rich world dreamed of their national champions becoming world-beaters. Governments in the emerging world welcomed the jobs, exports and technology that global firms brought. It was a golden age. Central to the rise of the global firm was its claim to be a superior moneymaking machine. That claim lies in tatters. In the past five years the profits of multinationals have dropped by 25%. Returns on capital have slipped to their lowest in two decades. A strong dollar and a low oil price explain part of the decline. Technology superstars and consumer firms with strong brands are still thriving. But the pain is too widespread and prolonged to be dismissed as a blip. About 40% of all multinationals make a return on equity of less than 10%, a yardstick for underperformance. In a majority of industries they are growing more slowly and are less profitable than local firms that stayed in their backyard. The share of global profits accounted for by multinationals has fallen from 35% a decade ago to 30% now. For many industrial, manufacturing, financial, natural-resources, media and telecoms companies, global reach has become a burden, not an advantage. That is because a 30-year window of arbitrage is closing. Firms’ tax bills have been massaged down as low as they can go; in China factory workers’ wages are rising. Local firms have become more sophisticated. They can steal, copy or displace global firms’ innovations without building costly offices and factories abroad. From America’s shale industry to Brazilian banking, from Chinese e-commerce to Indian telecoms, the companies at the cutting edge are local, not global. The changing political landscape is making things even harder for the giants. Mr Trump is the latest and most strident manifestation of a worldwide shift to grab more of the value that multinationals capture. China wants global firms to place not just their supply chains there, but also their brainiest activities such as research and development. Last year Europe and America battled over who gets the $13bn of tax that Apple and Pfizer pay annually. From Germany to Indonesia rules on takeovers, antitrust and data are tightening. Mr Trump’s arrival will only accelerate a gory process of restructuring. 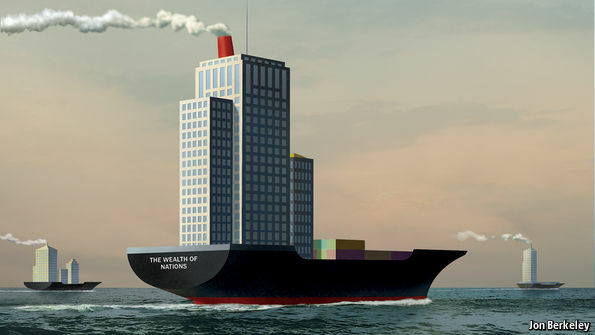 Many firms are simply too big: they will have to shrink their empires. Others are putting down deeper roots in the markets where they operate. General Electric and Siemens are “localising” supply chains, production, jobs and tax into regional or national units. Another strategy is to become “intangible”. Silicon Valley’s stars, from Uber to Google, are still expanding abroad. Fast-food firms and hotel chains are shifting from flipping burgers and making beds to selling branding rights. But such virtual multinationals are also vulnerable to populism because they create few direct jobs, pay little tax and are not protected by trade rules designed for physical goods. The retreat of global firms will give politicians a feeling of greater control as companies promise to do their bidding. But not every country can get a bigger share of the same firms’ production, jobs and tax. And a rapid unwinding of the dominant form of business of the past 20 years could be chaotic. Many countries with trade deficits (including “global Britain”) rely on the flow of capital that multinationals bring. If firms’ profits drop further, the value of stockmarkets will probably fall. What of consumers and voters? They touch screens, wear clothes and are kept healthy by the products of firms that they dislike as immoral, exploitative and aloof. The golden age of global firms has also been a golden age for consumer choice and efficiency. Its demise may make the world seem fairer. But the retreat of the multinational cannot bring back all the jobs that the likes of Mr Trump promise. And it will mean rising prices, diminishing competition and slowing innovation. In time, millions of small firms trading across borders could replace big firms as transmitters of ideas and capital. But their weight is tiny. People may yet look back on the era when global firms ruled the business world, and regret its passing. NEW YORK – For nearly four centuries, since the Peace of Westphalia in 1648 ended the Thirty Years’ War in Europe, the concept of sovereignty – the right of countries to an independent existence and autonomy – has formed the core of the international order. And for good reason: as we have seen in century after century, including the current one, a world in which borders are forcibly violated is a world of instability and conflict. But, in a globalized world, a global operating system premised solely on respect for sovereignty – call it World Order 1.0 – has become increasingly inadequate. Little stays local anymore. Just about anyone and anything, from tourists, terrorists, and refugees to e-mails, diseases, dollars, and greenhouse gases, can reach almost anywhere. The result is that what goes on inside a country can no longer be the concern of that country alone. Today’s realities call for an updated operating system—World Order 2.0 – based on “sovereign obligation,” the notion that sovereign states have not just rights but also obligations to others. A new international order will also require an expanded set of norms and arrangements, beginning with an agreed-upon basis for statehood. Existing governments would agree to consider bids for statehood only in cases where there was a historical justification, a compelling rationale, and popular support, and where the proposed new entity is viable. World Order 2.0 must also include prohibitions on carrying out or in any way supporting terrorism. More controversially, it must include strengthened norms proscribing the spread or use of weapons of mass destruction. As it stands, while the world tends to agree on constraining proliferation by limiting countries’ access to the relevant technology and material, the consensus often breaks down once proliferation has occurred. This should become a topic of discussion at bilateral and multilateral meetings, not because it would lead to a formal agreement, but because it would focus attention on applying stringent sanctions or undertaking military action, which could then reduce the odds of proliferation. Another essential element of a new international order is cooperation on climate change, which may be the quintessential manifestation of globalization, because all countries are exposed to its effects, regardless of their contribution to it. The 2015 Paris climate agreement – in which governments agreed to limit their emissions and to provide resources to help poorer countries adapt – was a step in the right direction. Progress on this front must continue. Cyberspace is the newest domain of international activity characterized by both cooperation and conflict. The goal in this area should be to create international arrangements that encourage benign uses of cyberspace and discourage malign uses. Governments would have to act consistently within this regime as part of their sovereign obligations – or face sanctions or retaliation. Global health presents a different set of challenges. In a globalized world, an outbreak of infectious disease in one country could quickly evolve into a serious threat to health elsewhere, as has happened in recent years with SARS, Ebola, and Zika. Fortunately, the notion of sovereign obligation is already advanced in this sphere: countries are responsible for trying to detect infectious disease outbreaks, responding appropriately, and notifying others around the world. When it comes to refugees, there is no substitute for effective local action aimed at preventing situations that generate large refugee flows in the first place. In principle, this is an argument for humanitarian intervention in selective situations. But translating this principle into practice will remain difficult, given divergent political agendas and the high costs of effective intervention. Even without a consensus, however, there is a strong case for increasing funding for refugees, ensuring their humane treatment, and setting fair quotas for their resettlement. Trade agreements are, by definition, pacts of reciprocal sovereign obligations regarding tariff and nontariff barriers. When a party believes that obligations are not being met, it has recourse to arbitration through the World Trade Organization. But things are less clear when it comes to government subsidies or currency manipulation. The challenge, therefore, is to define appropriate sovereign obligations in these areas in future trade pacts, and to create mechanisms to hold governments accountable. Establishing the concept of sovereign obligations as a pillar of the international order will take decades of consultations and negotiations – and even then, its acceptance and impact will be uneven. Progress will come only voluntarily, from countries themselves, rather than from any top-down edict. Realistically, it will be difficult to forge agreement on what specific sovereign obligations states have and how they should be enforced. Complicating matters further, US President Donald Trump’s administration has espoused an “America first” doctrine that is largely inconsistent with what is being suggested here. If this remains the US approach, progress toward building the sort of order that today’s interconnected world demands will come about only if other major powers push it – or it will have to wait for Trump’s successor. Such an approach, however, would be second best, and it would leave the United States and the rest of the world worse off. Now is the time to begin the necessary conversations. Globalization is here to stay. Moving toward a new international order that incorporates sovereign obligation is the best way to cope. World Order 2.0, predicated on sovereign obligation, is certainly an ambitious project – but one born of realism, not idealism. 17 tips for the new Trump administration, from heavy hitters on Obama's national security team. In their first post marking the relaunch of Shadow Government as a blog by foreign-policy officials who served under President Barack Obama, co-editors Derek Chollet, Colin Kahl, and Julie Smith promised to cultivate a loyal, respectful, and prescriptive opposition. The blog’s extraordinary roster of contributors has stepped forward to offer just that — practical advice for unsettling times. Collected here: 17 pieces of advice for President Donald Trump and his administration as it assumes the reins. From how to dance with Russia to how to set up the National Security Council in times of crisis, these insiders aren’t playing politics, they’re offering pearls of wisdom gleaned from years of experience. GET THE DEFENSE SECRETARY OUT ON THE ROAD. Perhaps the only reassuring thing to happen last weekend was the speedy confirmation of retired Marine Generals James Mattis at the Pentagon and John Kelly at the Department of Homeland Security. They are both strong leaders, levelheaded, fact-based, and non-partisan. (Full disclosure: I worked with them when I served at the Pentagon.) To help calm the world’s nerves — and to show that some pockets of stability and sanity still exist in the U.S. government — it is imperative that Mattis fire up the E4-B (the “doomsday plane” that doubles as the secretary of defense’s ride) and make several key stops. Ash Carter finished his Pentagon tenure with a backbreaking around-the-world trip, and that’s how Mattis should begin. He’s reportedly already making counterpart calls, which is good, but nothing is better than showing up. I’d start by heading West, stopping in Hawaii for a visit to United States Pacific Command, then onward to Japan and South Korea. From there, he should go to India (where the defense relationship has been blossoming), then to Afghanistan, which seems once again to have slipped into its status as the forgotten war. From there, he should go to Iraq, a place he knows well, for an update on the Islamic State campaign he now inherits. I’d then make three other quick stops in the region — Israel, Saudi Arabia, and Abu Dhabi. What about Europe? I’d actually wait on that — in mid-February, Mattis should go to NATO headquarters in Brussels, where there is the customary meeting of defense ministers prior to the Munich Security Conference. This time I’d recommend that Mattis travel with Rex Tillerson, Trump’s new secretary of state, and ask for a joint meeting to include foreign ministers. Then to Munich, where they could do an appearance together (much like Secretary of State John Kerry and Secretary of Defense Chuck Hagel did in 2014). After that, Mattis should head to the Baltics, and finally Ukraine, where the United States has invested hundreds of millions of dollars in security assistance. The message? The same one that Mattis conveyed in his confirmation hearing: That U.S. commitments will endure, that alliances matter, and that the administration will stand up to those who are trying to revise or destroy the liberal international order (e.g. ; Russia). Of course, that’s very different than America First, which may just accelerate the collision course Mattis seems to be on with his commander-in-chief. FIGURE OUT WHO YOUR FRIENDS ARE IN THE ISIS FIGHT. Over the past two-and-a-half years, the Obama administration put the Islamic State in Iraq and Syria on a path to defeat. The group has lost more than half of its territory in Iraq and about a third of its territory in Syria. Tens of thousands of Islamic States fighters and dozens of key Islamic State leaders have been taken off the battlefield. The group’s finances have been slashed; foreign fighter flow is down to a trickle; morale among the group’s rank-and-file is plummeting. Mosul is under assault by Iraqi security forces; and a coalition of Syrian Kurds and Arabs known as the Syrian Democratic Forces (SDF) are encircling Raqqa. If the Trump administration keeps up the momentum, the days of the Islamic State are numbered. The big decision that will confront team Trump in the next few weeks is whether to take the next step in providing more training and equipment to the SDF, which includes the Kurdish People’s Protection Units (YPG). The Pentagon will tell Trump that this is the only force capable of seizing Raqqa, the capital of the Islamic State’s self-described “caliphate” in Syria, anytime in the near future. But Turkey — which views the YPG as a branch of the Kurdistan Workers’ Party insurgency — will adamantly oppose any move to deepen the U.S.-YPG partnership and advocate for an alternative, Turkey-backed coalition of Arab opposition fighters that does not yet exist. My advice to team Trump: Do your homework, quickly. This decision could make or break the counter-Islamic State campaign and it could have profound and lasting implications for the bilateral relationship with a key NATO ally. MAKE RUSSIA PROVE IT IS CHANGING COURSE BEFORE LIFTING SANCTIONS. Trump’s determination to strengthen ties between the United States and Russia is well known (although his motives for doing so remain a mystery). Vladimir Putin and Trump are therefore likely to look for an opportunity to meet in the coming weeks or months. The first request from Moscow will be sanctions relief, since sanctions have been sapping the Russian economy for years. In return, Putin will no doubt promise more help in fighting the Islamic State, the one thing Trump repeatedly said he was seeking while he was on the campaign trail. But Trump and his team should proceed with caution and look for actual changes in Russian actions before delivering anything resembling sanctions relief. Putin has made many promises in Syria, some of which have only lasted a few hours. Putin also knows that unraveling sanctions is relatively easy but imposing them can take months, sometimes years, of negotiations. That is why any potential grand bargain with the Russians must be accompanied with clearly articulated, verifiable milestones that would need to be met before the United States would even consider lifting sanctions. GET THE NSC PROCESS AND COMMAND CULTURE RIGHT, EARLY. There are probably no more important early muscle movements for a new administration than setting up its National Security Council (NSC) process. As one former NSC colleague once told me, “process is your friend.” Sounds bureaucratic, right? Exactly. Process imposes accountability and transparency on departments and agencies. It tees up credible policy options for the president, and connects decisions to implementation. And most importantly, it helps protect the president from making major unforced errors. Hopefully, Trump has his Presidential Policy Directive-1 (or whatever he chooses to call it) ready to go. It should communicate to the government how he will make major national security decisions. Beyond process, make sure to set a good command climate with and among the Cabinet and NSC staff. National security is a team sport (occasionally a blood sport). It’s essential that departments and agencies are rowing in the same direction to advance U.S. interests and have respect for each other’s equities. That doesn’t mean there shouldn’t be vigorous interagency debate, but mutual respect is essential — it’s the grease between the wheels. Finally, Trump needs to trust the many agency and department detailees that he has inherited — they are the cream of the crop from across the U.S. national security departments and agencies and can help ease the shock of governing. They are patriots, not partisans. The president will need to decide how he intends to use his NSC staff — advisors, facilitators, implementers … or all of the above? The size of the NSC isn’t the most important factor to consider. Process and command culture, however, are. DON’T PIVOT AWAY FROM THE PIVOT TO ASIA. If the Trump administration wants to get tougher on China, it will need friends in Asia more than ever. Countries in the region have needed constant reassurance since the announcement of the rebalance to Asia in 2011, and most are nervous about what Trump and his focus on “America First” means for them. The United States needs strong diplomatic and military relationships with countries like Japan, South Korea, and Australia to be able to serve as a guarantor of stability in the region. Contrary to concerns that allies are not pulling their weight, Japan and South Korea host, and largely pay for, large U.S. military bases in both countries. Australia and Singapore also host U.S. forces, and the Philippines has agreed to welcome more U.S. forces, which could happen if President Rodrigo Duterte gets along better with Trump than with his predecessor. The Trump administration may focus on getting tougher on China, but if relationships with the other countries in Asia are left to languish, some of them may feel they have no choice but to get closer to Beijing just when the United States needs them the most. LEARN TO LIKE THE UNITED NATIONS. Antonio Guterres could be the best U.N. secretary-general we’ve seen in decades, if not ever. He certainly offers the best chance in a long time to implement the U.N. reform agenda that the Trump administration will have. Guterres is an adept diplomat and politician, and he knows the U.N. system like few others. He has set out plans for serious changes early in his tenure, on things the United States cares about, like updating a sclerotic personnel system, reforming the sprawling development architecture, and appointing more women throughout the U.N. He flew to Geneva in his first weeks in office to take part in Cyprus talks, and wants to be more involved on tough issues like Syria and protecting human rights, civil society, and people around the world. But he won’t be able to get any of this done without a constructive U.S. partner — there is too much entrenched bureaucracy and too many other countries that resist such progress. Guterres surely expects a tough partner in the United States — it’s our traditional posture. If instead he gets an antagonist, we will have squandered a unique opportunity. With 65 million people displaced around the world and millions more trapped in conflicts inside their own borders; with bad governments feeling free to flout international norms, target civilians militarily, and deny their people desperately needed humanitarian assistance; the United States quite simply can’t afford to cut off funding to the U.N. system, as some U.S. senators are recommending. Trump also can’t afford to stand aside and vent while other countries step into the lead. My advice is this: Trump needs to tell his ambassador to the U.N., Nikki Haley, to meet Guterres halfway, and the new administration will find in the new secretary-general just the partner it needs to drive real change at the U.N. The Trump administration — like every administration — should expect to get bushwhacked by legions of crises it never anticipated. A North Korean nuclear test, a dustup with China over Taiwan or the South China Sea, an incident between the U.S. and Iranian militaries in the Persian Gulf — these scenarios, along with plenty of others that aren’t even on the radar screen right now, could easily erupt in Trump’s first year in office. This administration will be particularly susceptible to mishandling such crises, due to its shambolic transition, its already evident divisions and turf wars, and not least of all, the president’s own penchant for blustery, rapid-fire responses to provocations. So the most important thing the Trump team can do is to take crisis preparation and management seriously — and that means taking process seriously. Establish clear lines of authority and responsibility in the interagency. Figure out which department or agency has the lead in responding to various potential crises. Create procedures for ensuring internal unity and discipline with respect to communications and strategic messaging. Do some crisis contingency planning now, to get a sense of what the pressures and options might look like when, say, Putin escalates in Ukraine. Get the U.S. president used to a more deliberative style of decision-making — it will come in handy in situations where information is fragmentary and first reports are often mistaken. And for God’s sake, hide the man’s smartphone. When that 3:00 a.m. call comes in, you don’t want America’s first response to be a 3:00 a.m. tweet. SEIZE AN OPENING WITH AMERICA’S TRADITIONAL ARAB PARTNERS. For a number of reasons, America’s traditional Arab partners, especially the Gulf States and Egypt, did not get along with Obama. Some of this was policy. They hated the Iran nuclear agreement, disagreed with our approach to Egypt, and wanted the United States to intervene in Syria. But much was personality and worldview. While Obama saw the world in gray, nuanced terms, many Middle Eastern leaders saw it in a much starker black and White. Trump should have a much easier time relating to these leaders, which creates an opportunity similar to the one Obama had with many U.S. partners in Europe at the start of his presidency. But it requires Trump and his team to be smart. What our Middle Eastern partners value above all else is stability. So the Trump administration should not upend the Iran nuclear deal — an agreement that U.S. partners in the region have come to accept. And it should not move the American embassy in Israel to Jerusalem, creating potential political and security headaches that no one in the region needs. Instead, the Trump administration should focus on countering Iran’s support for surrogates and proxies in Syria, Iraq, Yemen, Lebanon, and across the Middle East. And if the administration pursues a negotiated outcome in Syria, the United States should bargain hard and ensure there is no perception that Trump simply sold out the region to Russia and Iran. USE THE NUCLEAR SECURITY TOOLKIT. Nuclear policy decisions — from maintaining the U.S. stockpile to managing nuclear stability with Russia to dealing with Iran and North Korea — are arguably as important now as they were when Obama took office. Russia’s nuclear adventurism, North Korea’s advancing program, the growing, massive costs of the planned U.S. nuclear modernization, and the international divide between states that rely on nuclear deterrence and those eager to pursue a legal ban on nuclear weapons all demand effective responses. The United States has longstanding and proven tools with which to address some of these challenges. These tools have been effective in protecting the country and its allies for many years: arms control agreements, sanctions, deterrence, reassurance, and when needed, military force. All of these tools have their place, but the balance in using them is a challenge, and new tools must be developed to deal with the new challenges posed by proliferation. Nuclear security cooperation is the only way we can prevent the global threat of nuclear terrorism. Arms control cannot prevent cheating by Russia, but it can be used to rally U.S. allies and bring pressure to bear on Russia in the face of its non-compliance, while providing early warning of dangerous behavior. All of these tools rely on experts throughout the U.S. government and around the world and have no partisan roots. These approaches have benefitted both Republican and Democratic president’s alike, and the best advice for the new administration is to use what has worked while adding to the toolkit. We need all the help we can get in preserving the global norm of nuclear weapons never being used again. The consequences of failure are too great. UNDERSTAND WHAT MAKES TURKEY TICK. Turkey feels besieged by internal and external threats, for which it blames the United States. The Turks will ask you to do two things during your early weeks in office: extradite Fetullah Gulen and stop working with the Kurds in Syria. Turkey’s main complaint is that Gulen, an Islamic cleric accused of orchestrating the July 2016 coup attempt, is living in self-imposed exile in Pennsylvania. While Turks make the political argument that friends don’t harbor friends’ terror suspects, the United States has taken a legal approach requiring sufficient evidence to convince a federal judge of probable cause. Absent compelling new information or circumvention of U.S. law, the administration will find it hard to extradite him. Turkey also objects to Washington’s support for Syrian Kurds — the People’s Protection Units, or YPG — in the fight against the Islamic State. While effective fighters, the YPG are seeking to create an autonomous region along the Turkish border. Most Turks (and most analysts) see the YPG as the Syrian affiliate of the Kurdistan Workers’ Party, or PKK, a U.S.-designated terrorist organization embroiled in a decades-long fight against Turkish security forces that has caused over 40,000 deaths. If the administration uses well-advanced plans for the YPG to clear Raqqa, the Islamic State’s key holding in Syria, it must address the threat to Turkish security and engage Sunni Arab groups alienated by U.S. backing of Kurdish forces. Alternatively, the administration could delay the operation to find a force less threatening to our NATO ally. There are profound lessons to be learned from the past 16 years of U.S. engagement in Afghanistan. With 8,400 U.S. troops still in the country and billions spent per year sustaining our military and civilian footprint, Afghanistan remains one of the United States’ largest foreign policy expenditures, and has been the site of our nation’s longest active conflict. While it was hardly mentioned during the 2016 campaign, critical decisions are needed soon given the tenuous security situation. First, make a long-term commitment to Afghanistan’s future for the sake of U.S. national security and to safeguard all that the United States have achieved there, but be wary of defining this solely as a sustained or even increased troop presence. Afghanistan’s sustainability will depend on the integration of economic and political stability with security, and thus, diplomats and civilians need to be full partners with our military presence, in both planning and execution. Second, continue to invest in reconciliation efforts with the Taliban. If you don’t relish spending billions of U.S. dollars for years to come to support the Afghan military, then the only feasible way to achieve stability without significant commitments of financial and other resources is a negotiated political settlement between all parties. Yet that entails engagement with adversaries as well as sustained diplomatic outreach to a range of key stakeholders in the región. And third, recognize and embrace the key role of the international community in Afghanistan, which remains critical to its future stability. Afghanistan is the only instance of the NATO charter being invoked for the defense of a member country — at the request of the United States after 9/11 — and over 1,000 non-U.S., NATO military personnel have now lost their lives in the country. The EU, Japan, and others have led the donor conferences that will sustain Afghanistan in the future, most recently committing to $15 billion in the coming years. And to ensure this is not perceived in Afghanistan as a “clash of civilizations,” over a dozen Muslim-majority countries have also been publicly engaged in providing assistance. To squander this international financing, goodwill, and expertise would directly undercut U.S. national security interests. DON’T BASH ALLIES ONE DAY AND ASK THEM FOR HELP THE NEXT. Past administrations did this, and the United States found itself with few friends on the battlefield. Today, a great coalition of nations led by the United States is fighting the Islamic State and other terrorists across three continents. NATO is part of this fight, while also sending troops to shore up deterrence in the Baltic States and Poland. NATO has nothing to prove to anyone when it comes to relevance; terrorist acts and threats from hostile states have us relieved that we can “break glass and pull handle” to summon the nations of NATO. Can NATO do better? Can allies spend more on defense? Of course; but change happens only if the United States leads that change. U.S. leadership comes by sending our best to Brussels, armed with ideas and an ability to work with people. Change does not come at the end of a bayonet, but by patience and the ability to inspire politicians to do things they do not want to do. NATO can adapt. There are plenty of ideas to help it do an even better job. But disrespecting NATO and hectoring allies won’t bring change — only smart U.S. leadership will. U.S. soldiers next to their armoured vehicles near an Iraqi Army base on the outskirts of Mosul, on Nov. 23, 2016. THOMAS COEX/AFP/Getty Images. SUPPORT THE MEN AND WOMEN WHO SUPPORT THOSE ON THE FRONT LINES. As I departed the Pentagon last Thursday, my final day as under secretary of the Navy, I was reminded of what actually makes our Navy and Marine Corps the finest the world has ever known: our people. Without the thousands of professional civilians who — along with their uniformed military counterparts — staff our Pentagon headquarters and provide the logistical foundation or “tail” for our exquisite fighting force, we simply could not put ships on the water, planes in the air, bombs on target, or paychecks in the hands of our troops around the world; much less design and procure the 350-ship Navy the new president has promised. So, I urge you: Do not fall prey to the bogus and toxic narrative about some lazy or inefficient bureaucracy; that is not the workforce you are about to inherit. The men and women — civilian and military alike — who wake up every morning and come to work at our shipyards, depots, and bases, and all across our nation’s capital, are talented, skilled, and passionately devoted professionals. They are the most important national security infrastructure you can invest in as commander-in-chief. The Obama administration was often faulted for dallying over decisions: for being overly cerebral and deliberative and, as a result, missing opportunities to advance U.S. interests. In a world of accelerated information flows and instantaneous global communications, there is tremendous pressure to react quickly to events abroad — and the new Trump administration may feel additional pressure to demonstrate greater “decisiveness” in style as well as substance than its predecesor. But the tendency to swift and decisive action brings its own dangers. Most especially, thinking fast, as the Nobel-winning psychologist Daniel Kahnemann revealed, tends to make us overconfident, more likely to reason using ill-fitting analogies, and more likely to fall prey to the sunk costs fallacy, in which we double down on failing bets. By contrast, thinking slowly enables more careful weighing of real probabilities and risks (yes, it has its own set of biases, too). Policy choices are always made without perfect information and without sufficient time to test all the alternatives. And new senior officials inevitably enter their jobs with sets of preconceived notions about the United States’ role in the world and what the other team did wrong. Whether those preconceptions stem from ideology, resentment, bravado, or even hard-won experience, wise policy officials will insist that they slow their decision-making process down enough to question, and perhaps even repent, some of their assumptions. If they don’t do it for themselves now, the world will undoubtedly do it for them over time. AVOID THE PITFALL WITH YOUR PAL IN MOSCOW AND NEMESIS IN BEIJING. Don’t make the United States into Russia’s junior partner. If the goal is improved relations, denying the facts surrounding Russia’s interference in the U.S. election, questioning NATO, and obsessing about inauguration crowds all squander leverage. Putin is prepared to shower the new team with praise and get what he wants: U.S. cooperation in advancing Moscow’s agenda that American leaders claim as success. Don’t put China in the driver’s seat. Tillerson set an unenforceable red line, saying Beijing would not be “allowed” access to islands it claims in the South China Sea. It’s good to take a strong stand, but to say you won’t “allow” China on islands it already occupies? Really? At the same time, Trump added the flourish of an executive order to drive a stake into the already dead Trans Pacific Partnership. A red line it will not enforce and extra emphasis on America’s withdrawal from economic policy in Asia are concessions to core Chinese aims. Stop it. Russia is an adversary and treating it like a friend will make this administration a dupe or even a collaborator in weakening democracy around the world. China is a competitor you need to outsmart rather than bully. Take the high road by demanding that China play by the rules and step up to its responsibilities. Montenegro's Prime Minister Milo Dukanovic (L) attends a NATO foreign minister meeting next to NATO Secretary General Jens Stoltenberg (R) at NATO headquarters in Brussels on May 19, 2016. JOHN THYS/AFP/Getty Images. Last year, the 28 existing members of NATO voted unanimously to extend membership to Montenegro. There were many reasons to admit Montenegro into the alliance. The enduring rationale was to increase security and stability in the volatile Balkan region. But after Russia’s invasion of Ukraine, there was a new military rationale — to seal the Adriatic coast line, denying the Russians the opportunity to base forces there, as they have done in neighboring Serbia, or to station air defense systems there that could threaten U.S. and other NATO forces. The Russian reaction was extreme. Let’s leave aside the propaganda and the paying of supporters to try to block Montenegro’s own vote to join NATO: The Russians tried to assassinate the Montenegrin prime minister. The last and final step in bringing Montenegro into the alliance is for the legislatures of the 28 NATO members to ratify Montenegro’s accession. The United States is among the handful of countries that have not yet ratified. Sens. Bob Corker, Ben Cardin, John McCain, and Mitch McConnell have tried, but one or two senators are still standing in the way. It is unclear why, but what is clear is that only Russia would benefit from action to block Montenegro from joining the alliance. The president must tell the Senate to act swiftly and ratify Montenegro’s accession to NATO. Tell those few holdout Senators not to mess with Montenegro. TRUST THE CAREER STAFF: THEY’RE PROS. Early signs suggest this White House may well demonstrate the same disregard for fact that its standard bearer modeled on the campaign trail. But when it comes to national security decisions, hashed out in the relative privacy of the Situation Room, one hopes that the Trump team will take a different approach. After all, every White House needs to disentangle complex international crises, and every president needs a team that delivers unvarnished information and well-vetted options. The best place for a green White House team to start is with the resident experts: career staff on assignment to the National Security Council. Over 90 percent of Security Council staff are drawn from across the U.S. government — diplomats, military officers, intelligence analysts, often with careers spanning multiple administrations. Unlike former political appointees (like me), they returned to duty on January 23 — or, more likely, worked as usual through the weekend. It might be tempting for the incoming national security team — whose early picks, alas, reflect an alarmingly narrow portion of the talent pool — to view the career staff they inherit with suspicion. But the newcomers should trust the experts, and keep them. Career staff have seen the good and bad of the Obama years. They can bring a critical eye to the process of translating campaign rhetoric into practical policy. And, in dealing with foreign leaders, they know what has worked (and what has not). Michael Flynn and Thomas Bossert — and their boss — would be well served to draw on the expertise, energy, and ideas of these professionals. LONDON — As American allies across Europe and Asia brace for President Trump, Britain stands out for the degree to which it is proceeding as if little has changed. The country, consumed with managing “Brexit” and its associated domestic political dramas, appears to have taken relatively few steps to prepare for the geopolitical earthquakes that Mr. Trump could bring to the international and European orders on which Britain relies, and that his proposals would undermine. It is possible that Prime Minister Theresa May, by throwing in her lot with Mr. Trump, could ride out any changes to the international order. But if that approach does not succeed, it could have severe consequences both for her nation and for the world that Britain plays a role in keeping together. Mrs. May has sought to win over Mr. Trump, whom she will visit this week, just as her European counterparts are exploring more fundamental questions about American reliability. “The British debate on Trump is over very trivial stuff, like who Trump spoke to before May, and the German debate is over the future of the liberal order in the West,” said Mark Leonard, the director of the London-based European Council on Foreign Relations. Frank-Walter Steinmeier, the German foreign minister, wrote in a column this week for the German newspaper Bild that, with Mr. Trump’s election, “the old world of the 20th century is gone” and that Germany could confront drastic changes. “There’s an assumption that’s all going to remain,” he continued. Since Britain’s decline from a global power in the years just after World War II, the country’s foreign policy has rested on two pillars. First is the American-British partnership, which allows Britain to project its power and safeguard its interests globally. Second is European unity, which is essential for Britain’s economic prosperity and, by removing the centuries-old diversions of European conflict, frees up Britain to act on the world stage. But both of those pillars could now be crumbling under the strain of European populism, Russian resurgence and particularly Mr. Trump’s threats to step away from Europe. Britain’s challenge is not just that each of those elements is coming under strain. Mr. Trump’s avowed opposition to the European Union has put them in direct conflict. For instance, Mr. Trump offered to reward Britain’s exit from the European Union with a speedy trade deal. But this risks encouraging more exits from the bloc and possibly its disintegration. The resulting turmoil on the Continent, which includes several top British trading partners, could risk harming Britain’s economy far more than an American trade deal would help. Mr. Trump’s proposed alignment with Russia poses a similar quandary. Germany and other leading European powers oppose such a realignment, which they fear would open the way for Russia to dominate Eastern Europe, breaking the Continent’s unity on security matters. Mrs. May remains hawkish on Russia. But it is unclear whether she would oppose Mr. Trump on the matter, particularly as she more fully ties her fate to the alliance. “If America eases up on Russia, Britain will be under heavy pressure to pick the United States, not to side with Merkel,” said Robin Niblett, the director of Chatham House, a London-based think tank, referring to Chancellor Angela Merkel of Germany. Mrs. May is increasingly focused on maintaining the alliance with the United States, the world’s largest economy and military power. Whereas leaders such as Ms. Merkel have responded sharply to criticism from Mr. Trump, Mrs. May has been more forgiving. For example, she overlooked Mr. Trump’s decision to meet with Nigel Farage, a former leader of the fringe U.K. Independence Party, before speaking with her. Even if Mrs. May succeeds in upholding the alliance, it is unclear that her government is preparing for the range of more seismic changes that Mr. Trump’s election and other events could bring. British hopes, he added, often rest on Senator John McCain’s persuading of Mr. Trump to drop his controversial plans and revert to traditional positions such as upholding European unity. Mr. Shapiro said he had been unable to convince British officials that Mr. McCain, whom Mr. Trump has publicly mocked, was an unlikely savior. Lawrence Freedman, emeritus professor of war studies at King’s College London, said there was a simple reason that British leaders never seemed to discuss their backup plan should they fail to moderate Mr. Trump. “There isn’t a Plan B,” he said. 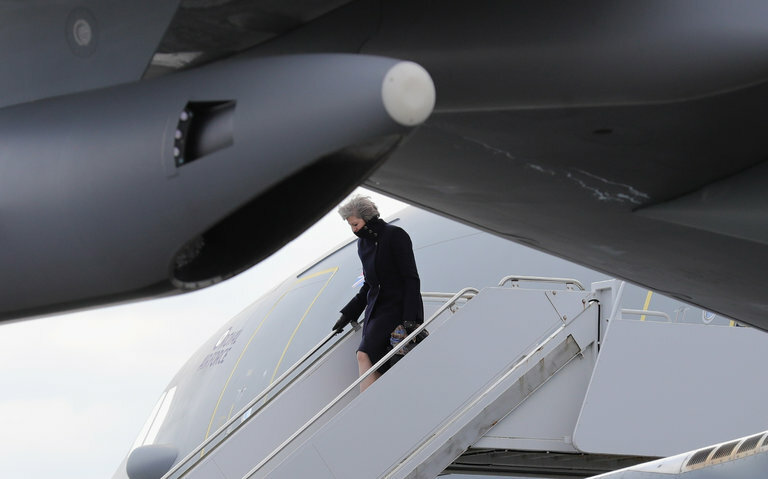 Preparing for life without American support, British leaders worry, could send the message that the United States can safely withdraw, risking exactly the outcome Britain wishes to avoid. “This has always been the problem,” Mr. Freedman said, because it leaves Britain unprepared for a situation that could be deeply destabilizing — much as it failed to prepare for Brexit. Brexit has focused attention inward, on day-to-day political dramas and on the countless challenges of negotiating Britain’s exit from the European Union. This is shaping British foreign policy in other ways. “There’s always going to be a question of whether we’re better off using our political capital to advance the international security order or to try to get a good trade deal,” Mr. Leonard said. Britain’s party politics also distract. Mrs. May is only barely holding together the governing Conservative Party, leaving her overwhelmingly focused on managing divisions that are mostly about Brexit and migration. Both she and her foreign secretary, Boris Johnson, have spent their careers focused on domestic issues. The opposition Labour Party is riven by its own divisions. Its leader, Jeremy Corbyn, tends to be skeptical toward Britain’s global role. As a result, there are no major voices in British politics who have an interest, either ideological or political, in addressing the country’s foreign policy challenges. Britons’ view of their country as a pillar of a European and world order, rooted in their experience of standing up to fascism and militarism in World War II, is also shifting. “Until quite recently, we saw ourselves as part-guarantors of the European order, but we don’t sort of see ourselves in that way anymore,” said Mr. Freedman, the King’s College professor. This has accelerated with the enmity toward immigration, which has focused politics inward and portrayed the outside world as something to guard against rather than to protect and uphold. That has ramifications beyond Britain. Even after Brexit, the country remains important for upholding the postwar order in Europe, where it is the largest economy after Germany and the biggest military spender after Russia. If its horizons continue to narrow, that will contribute to the Continent’s continuing fracturing on economics and opposition to Russian power. Mr. Niblett, the Chatham House chief, said he was worried Britain would become the “weak link” on European sanctions on Russia for its annexation of Crimea. “The U.K., which traditionally sees itself as upholding the spine of Europe toward Russia, is pulling itself out of that role,” Mr. Niblett said. Other European states are already preparing for the possibility that the Continent can no longer rely on Britain, Mr. Leonard said, on issues from Russia to the Iran nuclear deal to global free trade. “They don’t know if Britain’s going to be there or not,” he said. Forget about NAFTA or OPEC or TPP or crowd size or hand size or any other acronym or stat or concept that obsesses the financial press these days. Only two numbers actually matter. To put $20 trillion into perspective, it’s about $160,000 per US taxpayer, and exists in addition to the mortgage, credit card, auto, and student debt that our hypothetical taxpayer probably carries. It is in short, way too much for the average wage slave to manage without some kind of existential crisis. It’s also way more than it used to be. During his tenure, president George W. Bush (2000 – 2008) nearly doubled the government’s debt, which is to say his administration borrowed as much as all its predecessors from Washington through Clinton combined. At the time this seemed like a never-to-be-duplicated feat of governmental profligacy. But the very next administration topped it, taking the federal debt from $10 trillion to the soon-to-be-achieved $20 trillion. And the incoming administration apparently sees no problem with continuing the pattern. The other meaningful number is 6.620. That’s the average interest rate the US government paid on its various debts in 2000, the year before the great monetary experiment of QE, ZIRP and all the rest began. When talking heads at the Fed and elsewhere refer to “normalizing” interest rates they’re proposing a return to this 6% average rate. It’s $15,000 a year per family of four, or about a fourth of what the typical American family earns. It’s 31% of the federal budget, which would mean massive cuts in every other spending program. Government spending cuts and/or tax increases that impose Greek-style austerity on Americans who won’t respond well to their sudden demotion to Third World status. A new round of monetary experiments involving the “forgiveness” of the government’s debts, financed with newly-created dollars. This will work – as long as dollars remain universally accepted as a store of value. History offers no examples of such a thing. An overt effort to devalue the dollar, with the goal of paying the interest in full, but (again) with newly- created, much-less-valuable currency. The resulting dilemma: If we hope to live within our means interest rates can never be allowed to rise. But if interest rates don’t rise, the Fed is forced to create a tsunami of new dollars to keep rates low, and must take its chances with inflation, currency war, crack-up boom, and all the other black swans that live in the land of monetary excess. Which is why the sound money community keeps harping on gold. All the politically-acceptable policy options have inflation/devaluation at their core, and those things are always and everywhere great for real assets. 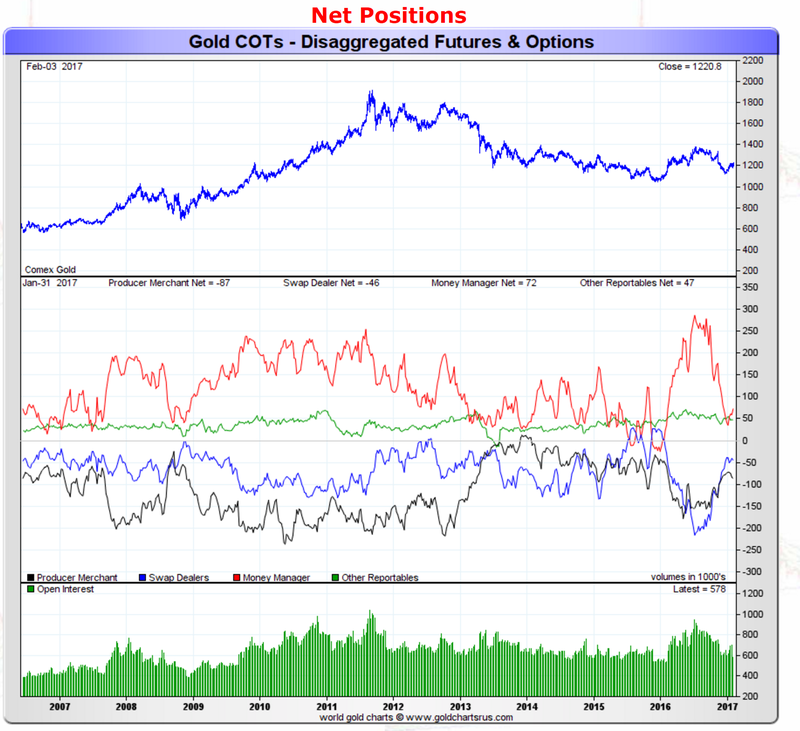 - Speculative longs added to gold positions as shorts covered. 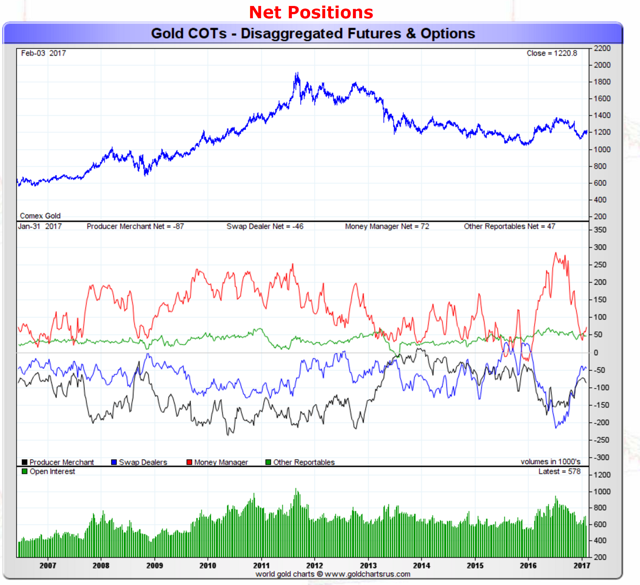 - Despite the rise in speculative longs, the gold price went down during the COT reporting period. - This is generally bearish in the short-term as it suggests that positive COT positioning was negated by outside bearish pressure on gold. Despite our short-term bearishness, we remain positive on gold for the long-term because structurally positive factors remain. 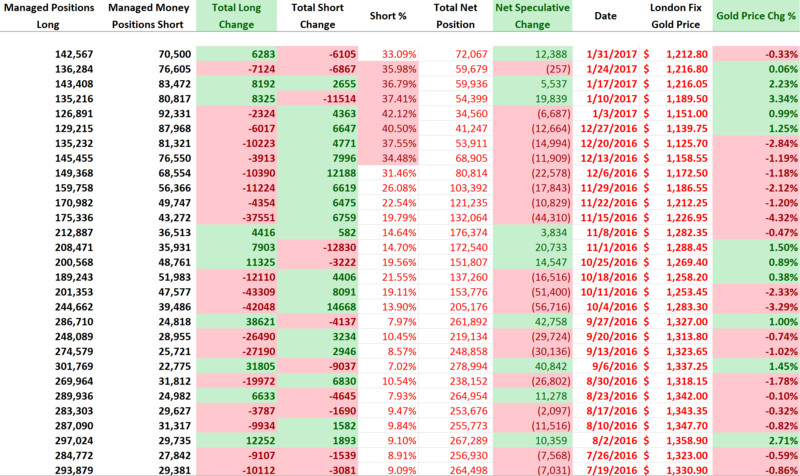 The latest Commitment of Traders (COT) report showed an increase in speculative longs while shorts closed out their positions as gold continued to meander during the COT week (Tuesday to Tuesday) closing slightly down. The three major events that we discussed last week all ended relatively positive for gold as the Chinese holiday didn't cause any major "hits" to the gold price, the Fed came out with a relatively dovish statement, and on Friday the jobs report was relatively neutral (job gains but wage and hourly earnings disappointments). On Friday afternoon, San Francisco Fed President John Williams threw a wrench in the mini-gold rally as he said in an interview on Bloomberg TV that despite the weak January jobs report and Wall Street's drastic drop in probability of a March rate hike, it was still possible. "I don't agree. All our meetings are live," he said to counter Wall Street's presumption. We will get more into some of these details but before that let us give investors a quick overview into the COT report for those who are not familiar with it. The big disadvantage to the COT report is that it is issued on Friday but only contains Tuesday's data - so there is a three-day lag between the report and the actual positioning of traders. This is an eternity by short-term investing standards, and by the time the new report is issued it has already missed a large amount of trading activity. There are many different ways to read the COT report, and there are many analysts that focus specifically on this report (we are not one of them) so we won't claim to be the exports on it. What we focus on in this report is the "Managed Money" positions and total open interest as it gives us an idea of how much interest there is in the gold market and how the short-term players are positioned. This week's report showed a rise in speculative gold positions for the third time in four weeks as longs increased their positions by 6,283 contracts on the week. 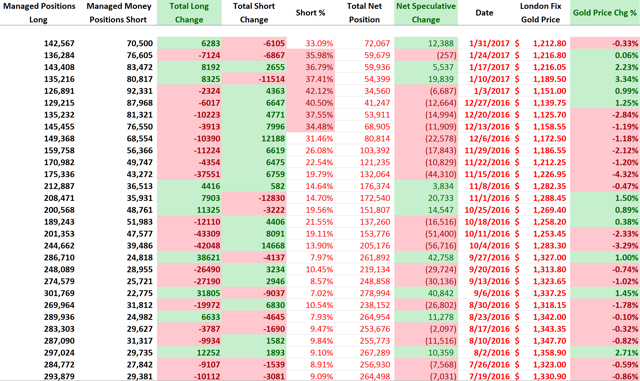 On the other side, speculative shorts decreased their own positions by 6,105 contracts on the week. The total net speculative increase was a little over 12,000 contracts, but interestingly enough, gold actually fell for the COT reporting period (Tuesday to Tuesday), which is often a short-term bearish sign. It suggests that despite increasing bullish bets on gold, there must have been other weakness otherwise the gold price would have risen. The red-line represents the net speculative gold positions of money managers (the biggest category of speculative trader), and as investors can see, we saw the net position of speculative traders increase by 12,000 as it ended the COT week at 72,000 net speculative long contracts. Despite the rise we are still fairly low in terms of the historical net long position. The red line which represents the net speculative positions of money managers, showed another increase in speculative positions for the week of around 7,700 contracts. As is obvious from the chart above, speculators have been much more bullish on silver than on gold. We are not sure why, but without any expected supply crunch or demand jump, this makes us much more cautious on silver than on gold. In our opinion this is simply the Fed trying to play both sides of the game as they want to keep uncertainty in markets so as not to have markets preempt any move (or non-move) on their part. 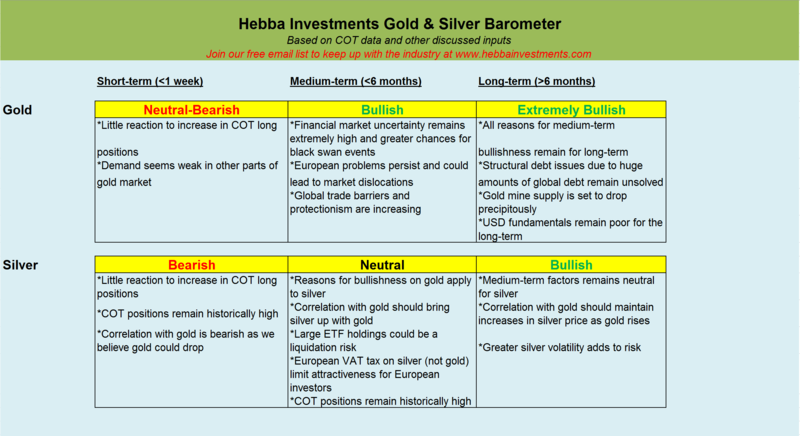 We will do something new this week and add a little gold "barometer" to sum up our opinion on gold in an easy-to-read table. The key to this and any other gold prediction is to understand the "why" in the prediction so we also give our reasoning for the barometer calls. In the short-term nobody can really predict the gold price anywhere close to 100%, anything over 60% for long periods of time. While we move to the medium and long-term, we become much more confident in the prediction as the structural issues that are not relevant in the short-term become much more important - and these are easier to foresee. We would love to hear our readers' thoughts on this new table so please give thoughts on this new table in the comments section. 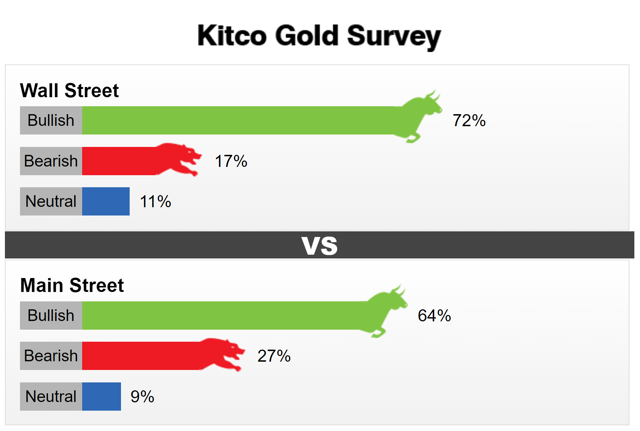 For the short-term (week-long timeframe), we are neutral on gold with a bearish leaning. The rise in COT positions for the week, but lack of increase in the gold price, suggests weakness in other areas of the gold market. This is slightly negated because we remain at relatively low historical levels of COT longs, thus there is room for additional longs to join the market. 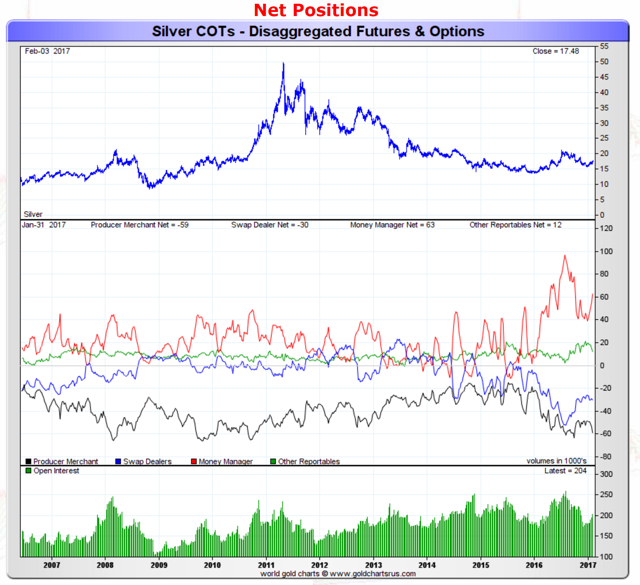 As for silver, we are bearish in the short-term for the same reasons as with gold except that silver has a much higher COT net speculative long position, thus it is much more vulnerable than gold. For the medium-term (less than 6-month long timeframe), we remain bullish on gold as structural issues and market uncertainties take precedence over short-term COT developments. Problems in Europe, potential trade barriers, global mistrust, and potential financial black swans make gold a buy for the medium-term. We remain neutral on silver as its correlation with gold is positive, but the much larger COT position and ETF holdings temper our bullishness. Additionally, the European VAT tax on silver makes gold more attractive for European investors. For the long-term (greater than 6 months timeframe - yes this is long-term in our current investment climate), we remain extremely bullish on gold as all the reasons to hold gold in the medium-term apply with the additional reasons of a weaker dollar (you can read why here), structural debt issues, and falling mine supply. 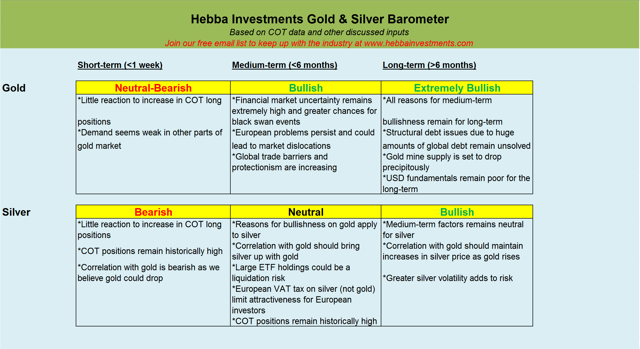 We remain bullish on silver for the same reasons mentioned for gold, but it remains riskier because of the large ETF holdings (liquidation would be scary) and its lack of central bank purchases. Its small market size though means additional volatility, and while this may increase silver gains versus gold, it also means much greater risk and thus the risk-reward advantage goes to gold and keeps us "bullish" and not "extremely bullish." We always like being contrarian so in our view that is another positive. These are our short, medium, and long-term views on gold and investors wishing to trade or invest in these prediction (or invest against) them can take the appropriate positions in physical gold (for longer term investors) or the SPDR Gold Trust ETF (NYSEARCA:GLD), and ETFS Physical Swiss Gold Trust ETF (NYSEARCA:SGOL). For silver, positions in the iShares Silver Trust (NYSEARCA:SLV), ETFS Silver Trust (NYSEARCA:SIVR), and Sprott Physical Silver Trust (NYSEARCA:PSLV) are all ways to invest. Again, we love to hear from readers and try to respond when we can, so please let us know what you think positively or negatively.